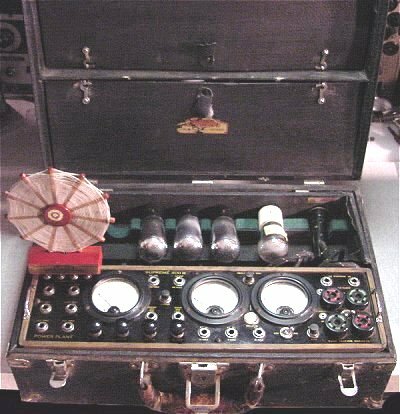 Supreme Radio Diagnometers were designed to give the radio service man all the test instruments he would need in one portable service unit. 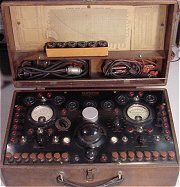 Supreme Diagnometers generally contained the functions of tube testers, RF signal generators, voltage, ohm, and milliamp meters, and condenser testers. 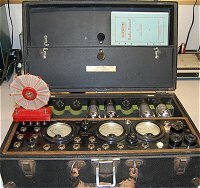 I have never seen the term "Diagnometer" used by any other company in the era of early radio and can only assume that Supreme Instruments coined the phrase and used it to describe their combination vacuum tube tester/multimeter/signal generators from the 1920s through the late 1930s when they produced their last Diagnometer. 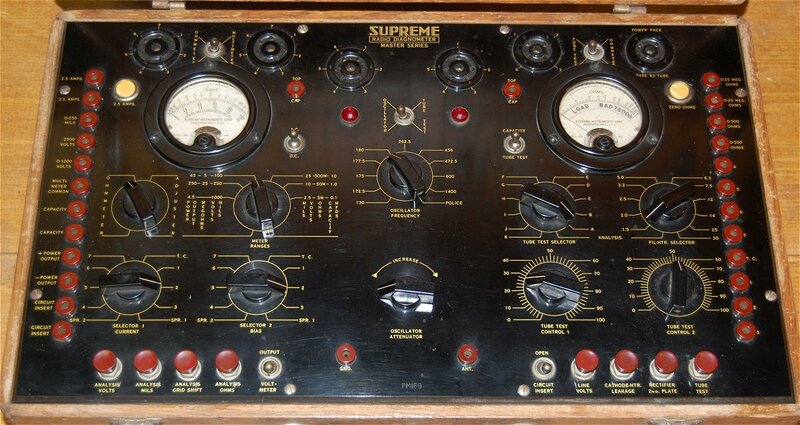 In their literature, Supreme also describes their radio service men in the early 1930s as "Supreme Diagnotricians". You can read a Supreme paper on the development of the Supreme Diagnometer here. 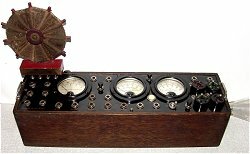 Below are all but one of the Supreme Radio Diagnometer models manufactured from the late 1920s to 1940. 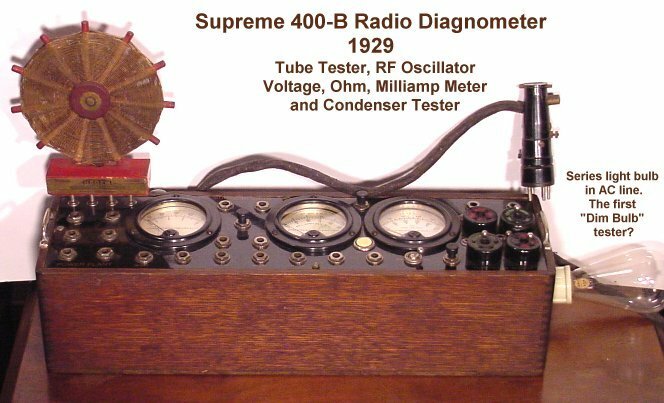 (1928) Supreme 400A Diagnometer The first of Supreme's Diagnometers, the 400A has only three tube sockets for testing. It contains a built in RF oscillator, tube tester, multi-range ohmmeter, and capacitor tester. The 4 pin RF Oscillator Antenna has two nickel plated test points on the top of the wooden base. 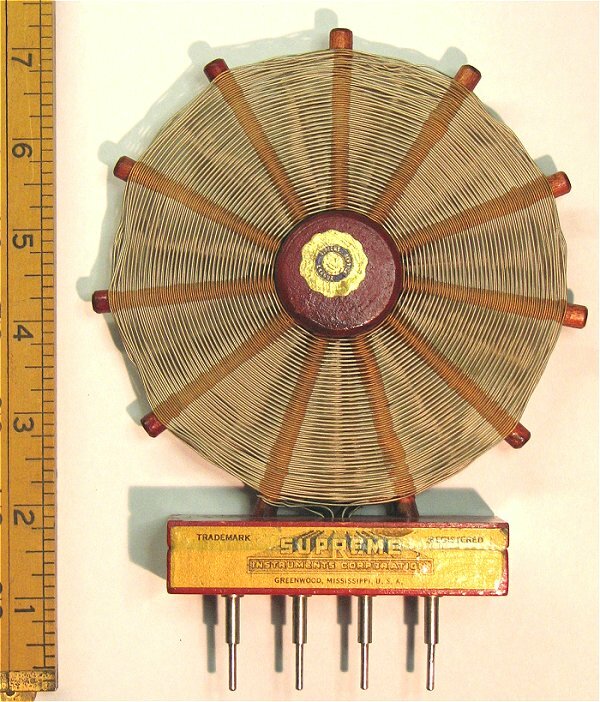 This 400A coil is smaller than the later 400B coil pictured below. The Diagnometer shown is set into it's service case. The case has storage compartments built into the top of the case and under the tube storing section for storing the power cord and test leads. 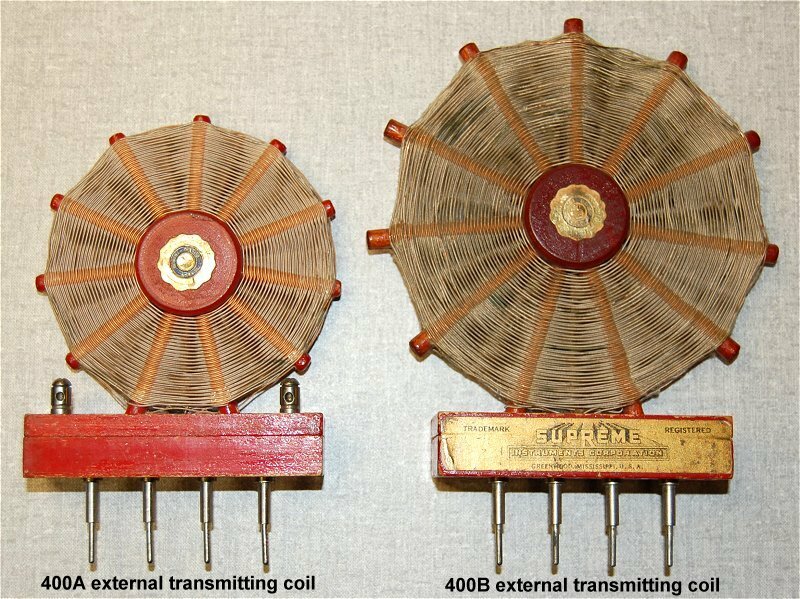 Size comparison of the 400A coil and 400B coil. The Supreme model 400-B Radio Diagnometer has the capability to test radio tubes in and out of the circuit. 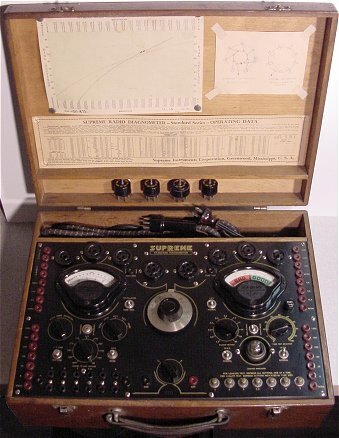 It is one of the first mutual conductance tube testers and also contains a built in RF oscillator (note the unique external transmitting coil top left) and measured AC volts, DC volts, and milliamps. It also measured condensers. A light bulb connected in series with the AC power cord was used to protect circuits by limiting current in case of any shorts or improper settings. 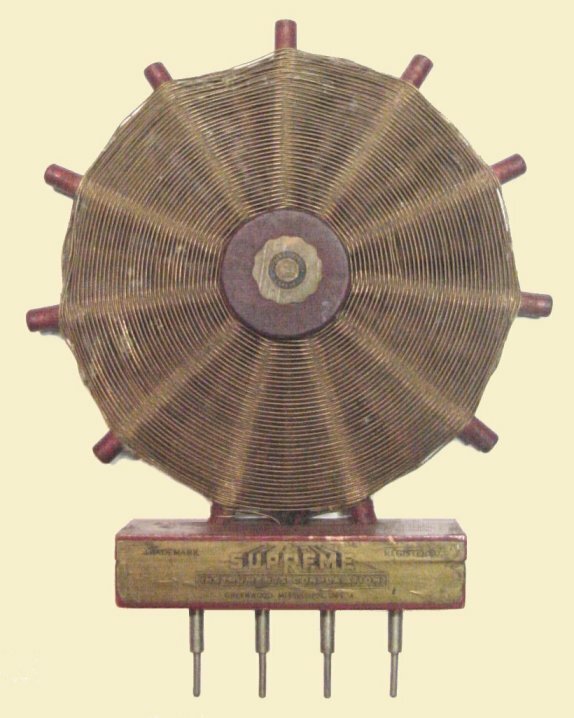 It is very similar to "Dim Bulb Testers" used on many of today's antique radio workbenches to help protect a radio under test. The 400B was also capable of tube matching and tube "rejuvenating". It was originally offered with or without an optional service case. 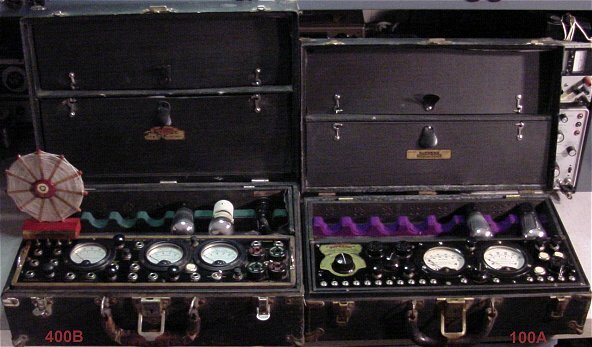 The case also contained compartments for parts and tools and held spare tubes. 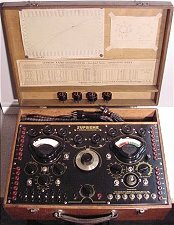 This model, the 400A above, and the Model 100A tube tester are the earliest examples of a "Tube Caddy" I have come across. The 400B Diagnometer measures 17 ¼" x 5 ¼" x 4 ½" without the service case. 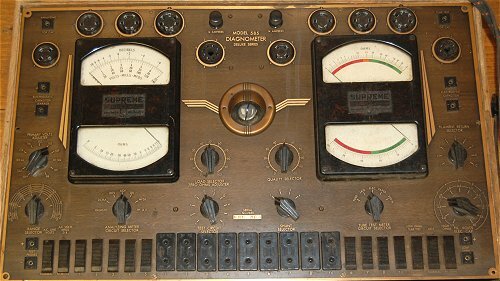 (1931-33) Supreme AAA-1 Diagnometer has a built in RF oscillator, tube tester, multi-range ohmmeter, and capacitor tester. The factory oscillator calibration chart for this unit is dated 12/9/33. This Diagnometer is built into a large wooden case that measures 18½" x 11¼" x 7". Notice the storage compartment built into the top of the case for storing the power cord and test leads. 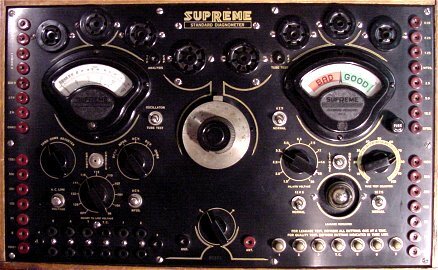 (1934) The Supreme Five Unit Radio Tester has a built in RF oscillator, tube tester, volt & ohmmeter, and a capacitor checker. 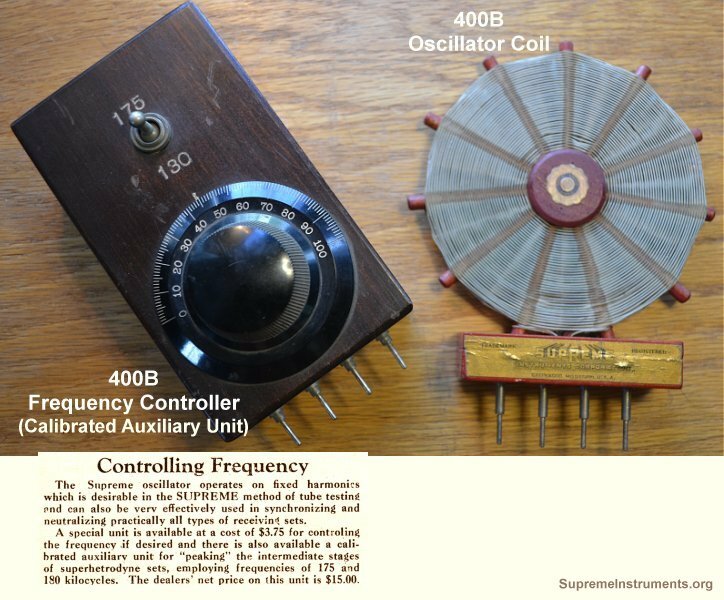 Unlike the 400 series Diagnometers listed above this model has a jack for using an external antenna lead for testing with the RF oscillator. 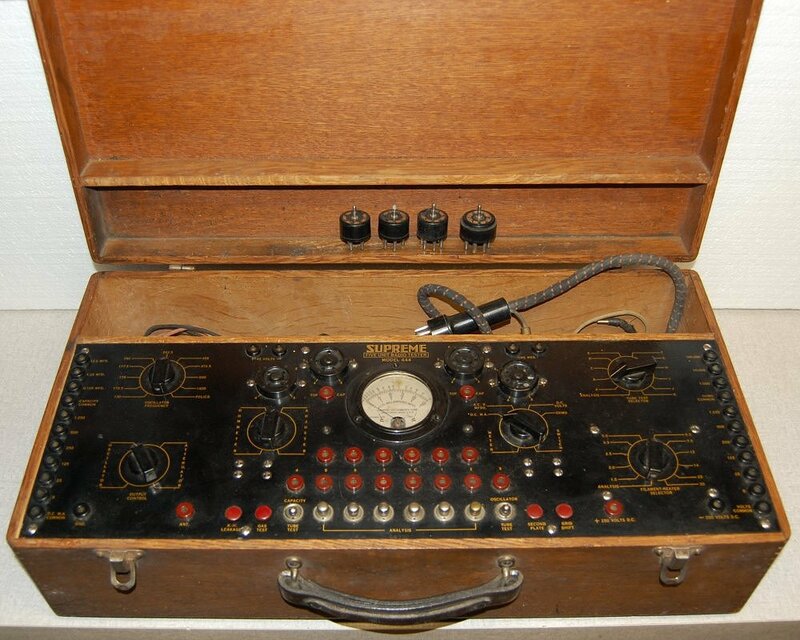 The wooden case measures 22½" x 11½" x 6¾". Although not listed as a Diagnometer, Supreme literature describes the 444 as a successor of the 400B Diagnometer. The Supreme Standard Diagnometer has the capability to test radio tubes in and out of the circuit. It has a built in RF oscillator and measures AC volts, DC volts, DC milliamps, resistance, and tests condensers. 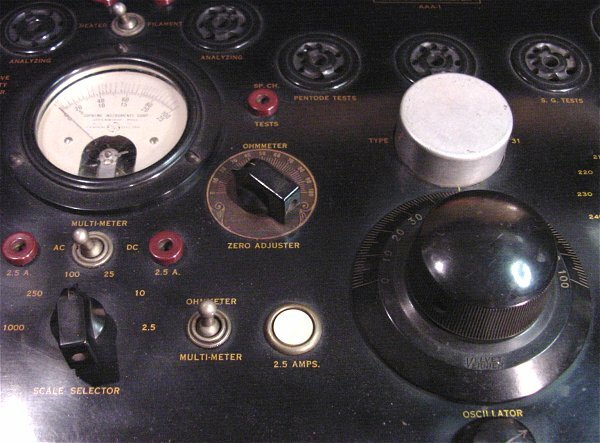 The factory oscillator calibration chart for this unit is dated 11/16/34. This Diagnometer is built into a large wooden case that measures 19" x 14" x 6". 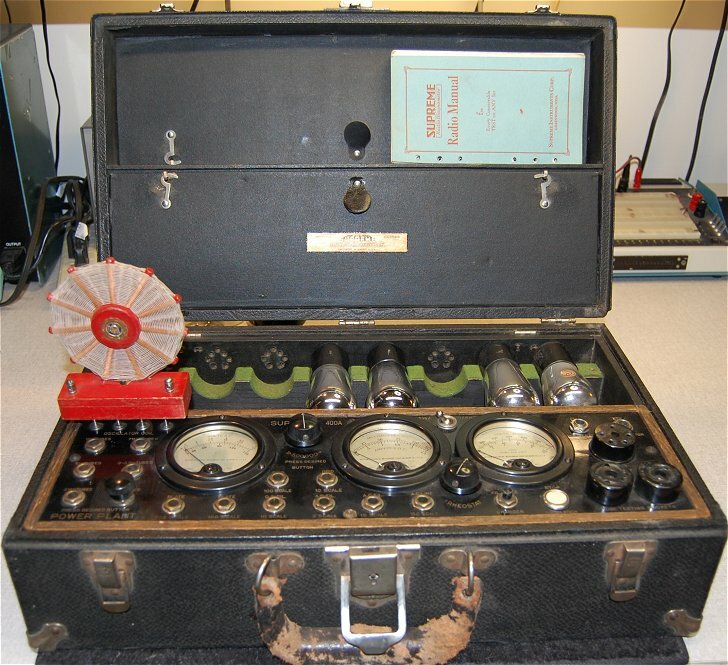 The Supreme Master Diagnometer also has similar capability to test radio tubes in and out of the circuit. It has a built in RF oscillator and measures full ranges of AC volts, DC volts, DC milliamps, resistance, and tests condensers. The shielded oscillator offers 11 frequency ranges. The Master Diagnometer also brings each tube pin out to a jack to enable Free Point Testing. 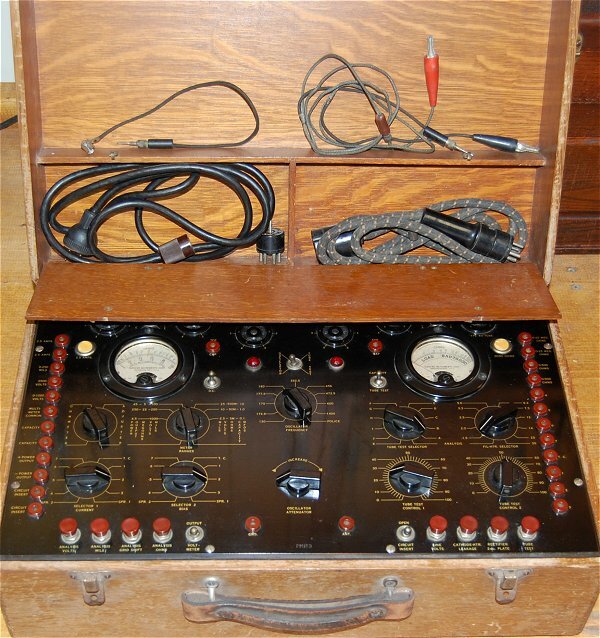 This Diagnometer is built into a large wooden case with a storage compartment built into the top of the case for storing the power cord and test leads. The oak case measures 20½" x 12½" x 8". 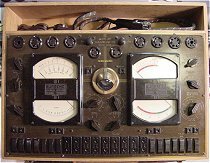 The last model of the Diagnometers, the model 585 (two versions) have similar capability to test radio tubes in and out of the circuit as the earlier models shown above. They measure AC volts, DC volts, milliamps, resistance, and test condensers. The 585 is a Free Point Tester with all pins marked on the tube sockets with selectors and panel jacks for easily measuring voltages on all tube pins. 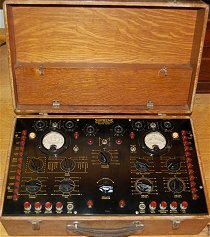 These Diagnometers have etched brass faces with dual "Quadri-meters" and are built into large wooden cases that measure 21" x 16" x 8". 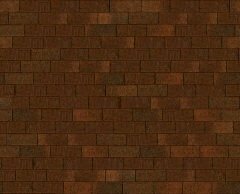 Both versions of the 585 are shown at the left. The top 585 has a later panel layout than the original panel layout of the bottom 585. The bottom photo is the original panel version shown in the 1938 catalog photo.